I've been following the development of Aikea's awesome ear birds for a few days now on plurk and loved the cute widdle guys a LOT. She then posted a picture of a few OTHER places that the birdies could go, and … hah, I totally think she should go into a line of Piece accessories. Hear that, Aikea? Please to make happy animals that sit cutely on top of male bits, ok? I'm not sure why I randomly decided to add words to my top photo. 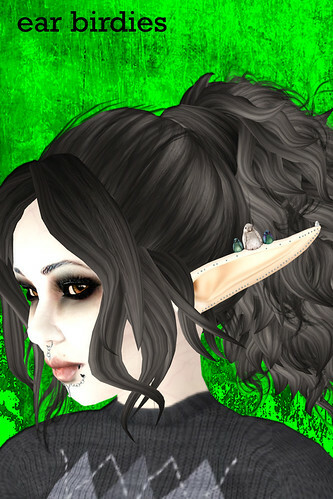 I guess to point out that I've got tiny birds sitting on my ears -- the ears and birds all are color scripted, including an option to tint them yerself. I love the variety of bird colors, including "Poe," which has a gorgeous raven sheen. Speaking of bits, please notice how amazing my bottom looks in these pants. I have back in this Ingenue sweater and pants set!